August is a time of both excitement and concern. Excitement because in little more than a month, many bow seasons are going to open, providing a crack at the coming autumn's first bucks (and if you hunt South Carolina's Lowcountry, gun season opens mid-heat wave). Concern because inevitably there is a list of projects as long as my arm that need to be done on the properties I hunt. Sure, I could just wing it and accept that deer will be on the land as they always are and hope I'm in the right spot when one walks by, but I like to narrow the odds as much as possible. The single best thing any hunter can do to put those odds in his favor come opening day is to plant something deer will want to eat or identify key food sources that will naturally draw deer. Best of all, it doesn't have to take a ton of time or money. 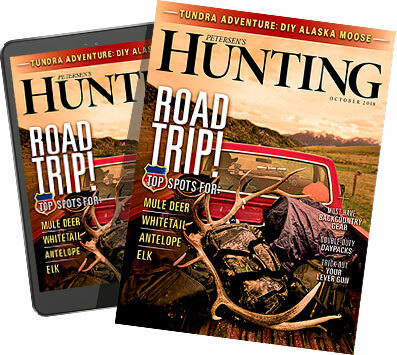 Grab a recent satellite image of the land you're hunting, and identify four key areas: good cover, existing openings, existing food sources such as planted crop fields and oak stands, and, of course, areas where you've traditionally seen a lot of deer. After you've marked these spots on the map, highlight the ones that are toward the interior of your property and away from roads. You also don't want interference from hunters on adjoining properties. The closer to a bedding area and the less human traffic a spot receives, the more likely it is going to produce throughout the season. Hopefully, you have some existing trails, log decks and even old openings or slightly neglected fields that can easily be mowed, disked and planted without having to clear timber. These highlighted spots are the ones you want to plant. Don't waste time or money planting spots that will be disturbed by others outside your group of hunters. It would be great if all of us owned huge fields and had the equipment and resources to plant them in clover and brassicas, but that's not reality for most of us. 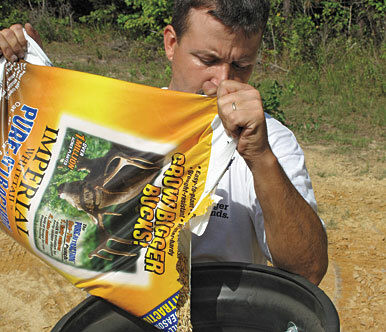 Seed and fertilizer can get expensive fast, so identify how much acreage you have to plant, how much you can afford to plant, then spread out some of your plantings across the interior of your property in areas close to good bedding areas where deer can slip in and out with minimal travel once the guns start booming. That's a better option than just planting one big, impressive field and sitting the same area every time you hunt. "For a guy with about four acres available to plant, I would highly recommend, if he is working with a set budget, to do one or two acres and do it right rather than spread it out over four acres and do everything haphazard," says Whitetail Institute's Steve Scott. That means locating four or five smaller open areas to disk and plant. When selecting spots to be planted, ideally you want them a half acre to one acre in size, though plots as small as 1/3 of an acre can work really well, particularly when tucked away among heavy cover that has limited natural forage. Smaller than that and deer can over-browse the plot before hunting season ever arrives. Try to plant areas that have a north-south orientation rather than an east-west one so that the sun travels across the width of the area throughout the remaining growing season, but won't bake the soil dry in those late-summer/early-autumn days where the mercury still soars. Manufacturers have responded by making some great annual mixes designed specifically to grow fast in late summer and early fall with minimal care. Most hunters think clover, and while it is good to toss some of the perennial in with whatever you decide to plant, clover works best in loamy soils and won't establish much benefit when planted in the fall. It will, however, establish roots, go dormant in the cold and jump-start any spring planting you might be considering. Top planting options for fall include winter wheat, oats, rye and brassicas. Some of my favorite mixes I've had luck with on my property include Whitetail Institute's Pure Attraction, a mix of forage oats, winter peas and brassicas that sprout early for the rut but provide food throughout the colder months as well, and their Tall Tine Tubers, a mix of brassicas and turnips that will sweeten upon the first big frost and deer will relish. I've also enjoyed great success with Hunter's Specialties' Vita-Rack E-Z Grow, Vita-Rack Winter Forage and Biologic's Full Draw. Winter peas from a local feed-and-seed store also do great and quite often are extremely affordable. If the land you hunt has crop fields planted in soybeans, corn or wheat that will be harvested and wiped out by late fall, focus early-season hunts on those spots. That's where the deer will be, barring the dropping of white oak acorns. Plant all of your plots with late-season brassicas so you can transition to these new spots with cold weather. If you hunt somewhere as nutritionally barren as a Southern pine plantation, be darn sure you plant a mix that will produce early so you attract deer and get the first crack at the biggest feeding bucks with a bow before the gun boys roll in later in the season. For the hunter looking to establish small spots with minimal effort, Whitetail Institute's No Plow and Secret Spot mixes, as well as Evolved Habitat's Throw & Gro, both require little more than raking out an area, roughing up the dirt and hand broadcasting fertilizer and seed. It gets no easier than that and can make more of a difference in your hunting success than buying that new gun or scope. A proper pH of 6.5 to 7 will yield the most lush growth from plantings, but unless you've been hitting the soil with lime for several years or planting in an existing ag field, it's unlikely you're going to be anywhere near that. In most areas, soils will be more on the acidic side. While a soil test is absolutely recommended before undertaking plantings (most county soil and conservation offices will analyze your soil samples for free), if your budget is tight and you're considering chintzing out on one or the other, do not forego the lime.